Plastic provides great design freedom, allowing for gear configurations too difficult or expensive to create with metal. 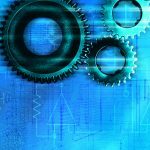 Plastic gears have a long history in autos, appliances, office equipment, tools, and elsewhere. Designers continue to extend their use in transferring torque and motion as polymers improve and processing gains in sophistication. They often choose plastic for gears over metal because of the many benefits plastic offers. Plastic provides great design freedom, allowing for gear configurations too difficult or expensive to create in metal, such as cluster gears, in which more than one gear is created in a single molded part. Plastic gears also offer good loading properties, relatively low noise, excellent wearability and lu bricity, and good chemical and thermal resistance. 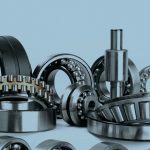 A growing preference for plastic gears is evident in the automotive industry, where electrical systems are eliminating hydraulics and cables in both interior and exterior applications. These systems depend on plastic gears for the smooth and quiet operation of lift gates, tracking headlights, window movements, underhood electronic throttle body controls, and much more. Cost alone is a strong motivator for selecting plastic. Powdered metal gears often cost about twice as much as a comparable thermoplastic gear. The same gear hobbed from a metal gear blank typically costs three times as much. • Non-linear gears that have a tailored output. Such gears involve a variety of design methods, including those having eccentric shaft locations and thus varying displacement profiles, elliptical, and other out-of-round gears that cycle through various speeds and torques with each rotation, and gears having step changes in radius so power output shifts suddenly to meet the needs of an application. 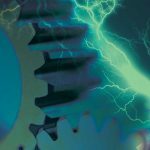 • Epicyclic gears, one approach to split power paths, which offer greater power and torque transfer in a relatively small package. 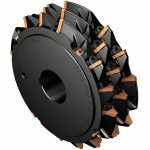 • Herringbone gears, in which two helical directions meet to cancel out axial thrust loads that are typically detrimental to simple helical plastic gears. • Two-shot molded gears that allow a variety of solutions to common gear issues. Examples of this include gears having a rigid core and a lubricous surface layer or a gear ring and hub of the same polymer separated by a shock-adsorbing material. • Crowned gears have been demonstrated in plastic to help maintain transmission accuracy in transmissions where shaft alignment is less than optimal. 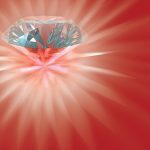 One example of this involves lead crowning, where the teeth can be taller, thicker, or both at the center of the gear face in order to overcome poor load distribution due to misalignment. • Zero- or low-backlash designs that eliminate clearance between gear teeth. Such designs help overcome manufacturing errors and bearing run-out. They also help limit noise in lightly or moderately loaded gears that reverse direction repeatedly. • Tooth profiles having customized pressure angles on their forward and reverse flanks to enhance efficiency and sliding, tailor bending stress, and reduce heat and noise. 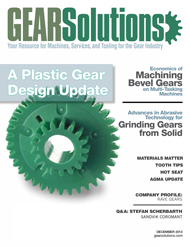 The ability to craft far more precise plastic gears is also growing. 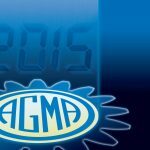 Gear molders commonly attain an AGMA quality level of Q7. Q10- level gears are in production with molders who commit to the equipment and systems necessary to produce this result. The ongoing quest for quieter drives has been a strong impetus in advancing plastic gear design, especially in cars, homes, and offices. This has led to the use of more lubricious or flexible polymers, improved precision, and new tooth shapes. In the latter case, plastic readily creates unique profiles, such as teeth having varying pressure angles, which minimize transmission noise and effort, especially at low power. 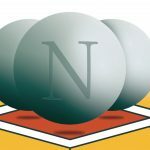 One strategy to reduce gear noise involves two-shot molding in which teeth made of a softer polymer are placed on a stiffer gear center or stiffer teeth are overmolded on a softer, vibration-absorbing core. The concept previously mentioned in the bullets, in which an elastomer is molded between the hub and teeth absorbs gear shock load, limits noise and prevents tooth damage during hard stops. In large gears, cored teeth lower noise and aid accuracy. Such coring also avoids large plastic masses that make gear geometry hard to control. Housings need as much attention as the gears they contain because they must hold precise gear alignment under all conditions of use. This means housings must be stiff, strong, and dimensionally stable. Long fiber reinforced plastics offer one option for gaining such properties. Gear and housing materials should be chosen carefully to avoid large disparities in thermal expansion. This is especially important in smaller gear boxes that have tighter tolerances and, given their smaller volumes, often work at higher temperatures. Engineering thermoplastics that tolerate elevated temperatures and thermally conductive polymer blends can help avoid potential problems that may arise through frictional heating. The lubricant present also affects gear box design and power. 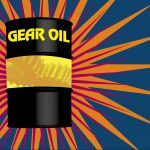 Larger, more powerful gearsets tend to run with oil, while smaller, lower-power gears often run dry or require low wear, internally lubricated plastics. Greased gears fall into an intermediate range. The trend is to push dryrunning gears to higher power levels because their gearboxes are simpler and eliminate the expense and nuisance of handling grease. This trend calls for enhancing already lubricious polymers, like acetal copolymer, by blending in polytetrafluoroethylene (PTFE) or silicone to reduce the coefficient of friction, wear, and noise further. While published polymer data sheets are a good starting point for selecting a gear material, designers must test potential gear resin formulations for wear, fatigue, and noise under conditions that simulate working gear environments. The Celanese Plastic Gear Evaluation and Research unit (the P-GEAR unit) is a good example of test equipment that generates such data. The complexity of a gear application means that the characterization done by the unit for one or more plastics must be confirmed by the designer in the field before the designer makes a final polymer selection. This unit is a precision dynamometer that evaluates gearsets at loads having a maximum torque of 100 lb.-in. at speeds to 4,000 rpm. It accommodates parallel-axis gears with center distances to 5 in., as well as worm gears and other cross-axis drives. The tester measures such parameters as temperature, acoustic emissions, backlash, and transmission error. The data it provides allows an understanding of overall gear quality and performance, as well as fatigue strength, contact stress, wear, average tooth temperature, mesh stiffness, and tooth breakage. Encoders monitor the relative position of meshing gears under programmed loads to quantify backlash and indicate tooth stiffness, wear, and transmission error. Wear is determined at set loading rates and speeds. The tester also defines a gear material’s fatigue strength by recording the number of cycles until teeth break at various torques and temperatures. The P-GEAR unit also records the sounds created by meshing gears via digital acoustic monitoring. Gear noise is due to transmission and alignment errors, gear inaccuracies, and tooth stiffness. At low speed without lubrication, squeaking occurs as materials slide over each other. The tester evaluates noise and documents how well different material combinations and resin formulations reduce noise. Many factors come into play when selecting gear plastics. A polymer’s modulus should allow for tooth deflection to reduce impact and noise, yet withstand tangential forces. It should have sufficient fatigue strength to handle the cyclical loading and unloading of the gear teeth and the tensile strength to handle repeated shock loads. It also should have the creep resistance and dimensional stability to maintain contact ratio, tip clearance, and overall gear geometry. Dimensional stability is a complex factor affected by water and chemical absorption and temperature-related factors such as shrinkage as gears cool after molding and thermal changes in the field due to ambient conditions and friction. It is also important to note how a resin functions in contact with other plastics or metals in the system. Mating dissimilar polymers in a gearset often creates drives that run smoother, quieter, cooler, and with less wear. However, matching the same plastic in adjacent gears makes it easier to match dimensional variations as temperature and moisture change. 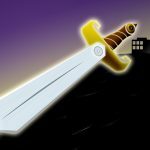 This is particularly true if the same material is used in the housing. 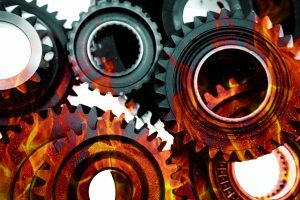 The most often used thermoplastics in gears are acetal, polyester, and nylon. 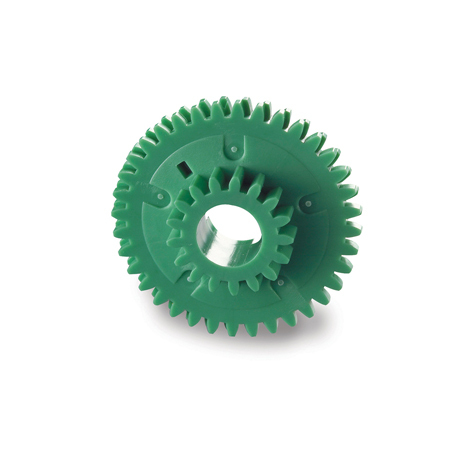 These engineering plastics create strong and precise gears having good fatigue and wear resistance. The range of plastics available for gears helps designers cope with the temperatures gearsets will seein use. Acetal copolymer works well up to 100°C, polybutylene terephthalate can be used to about 150°C, nylon 6/6 to about 175°C, and polyphenylene sulfide (PPS) to 200°C. High temperature nylons and polyphthalamide have somewhat lower thermal limits than PPS, while liquid crystal polymer, imides, and polyetheretherketone have higher limits. Acetal is widely used in gears given its dimensional stability, fatigue resistance, and ability to withstand many chemicals over a wide thermal range. It is highly lubricious and so moves smoothly over metals and plastics. 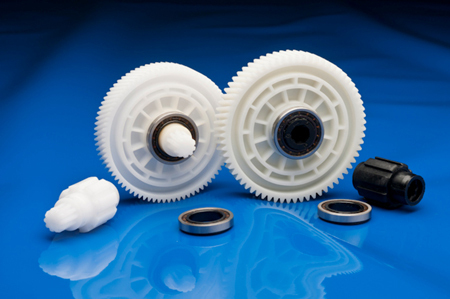 Even after 40 years as a gear material, acetal continues to evolve. For example, recently introduced grades of Celcon® acetal copolymer include: non-squeak grades that combine high toughness and fatigue resistance; those with elevated PTFE levels; higher lubricity grades that cost less than those containing PTFE; and special glass-filled grades containing silicone. Polybutylene terephthalate, a polyester, works well in mixed gearsets having gears made of other plastics and metal. It produces extremely smooth surfaces in molding and is often used in housings. Nylons offer exceptional toughness and wear well against other plastics and metals. Their tendency to absorb water and many lubricants can lead to dimensional change, so designers usually turn to other polymers for precision gears. Nylons are often used in worm gears and housings. Polyphenylene sulfide is stiff and dimensionally stable and offers good fatigue life and chemical resistance. It is often the material of choice for drives in hot, corrosive environments. In automobiles, PPS gears are found in electronic throttle controls, turbo actuators and their housings, and lubricant circulating pumps for transaxles and transmissions. Liquid crystal polymer works well in watch gears and other small, precision, and lightly loaded gears. It is dimensionally stable to 220°C and resists most chemicals. It flows exceptionally well to fill intricate, thinwalled parts with great accuracy. It also has very low shrinkage in molding and yields almost no flash. Other plastics have had limited success in gears. Polycarbonate, for instance, is not a good gear material because of its poor chemical resistance, lubricity, and fatigue properties. Commodity resins, like acrylonitrile butadiene styrene, and low-density polyethylene, lack the chemical, thermal and creep resistance, dimensional stability, and other properties needed in precision gears. Their use is generally restricted to basic, low-load or low-speed gears. Fibers and fillers dramatically alter a gear resin’s properties, so designers can turn to them to fine tune a material to an application. Acetal copolymer chemically coupled with 25 percent short-glass fibers 2 mm or less in length, for instance, has more than twice the tensile strength of the base resin and more than triple its flexural modulus. 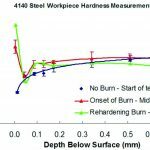 Adding glass fibers longer than 10 mm has an even more profound effect on strength and stiffness, as well as on creep resistance, dimensional stability, toughness, and impact resistance. Long fiber-reinforced plastics can contain as much as 60 percent glass fibers to give housings and large gears greater strength and dimensional stability. Substituting carbon fibers or aramid fibers for glass improves gear wear. Long fiber plastics also yield better surface quality because they have fewer fiber ends to break the surface versus plastics containing short fibers. Long fiber grades also allow the use of less costly polymers, e.g., a long fiberreinforced polypropylene can create housings having equal or better strength, stability, and other properties at a lower cost than nylon reinforced with short fibers. Designers continue to take lubricated and unlubricated plastic gears to new levels. 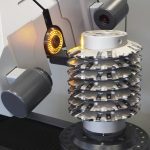 Not only are designers creating ever larger, more-powerful, and more precise gears, they are finding ways to shrink gear boxes while retaining the power of larger ones. 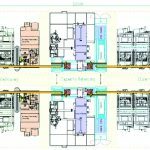 They are also developing quieter drives and making longer-lived gears having teeth more forgiving of manufacturing error and operating misalignment. Such advances call for a variety of gear concepts. Many of these have been proven in metal and are being migrated over to plastic, such as crowning gear teeth. 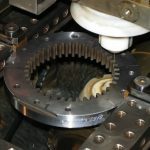 Others are unique to plastic gears, such as zero backlash designs and molding gear teeth with variable pressure angles to improve operating efficiency. Even after decades of use, plastics continue to gain credence as a gear material. 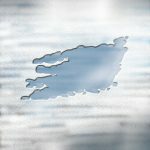 They are often chosen over metal for the many fabrication and performance benefits they offer. They can consolidate parts in existing metal drives to reduce fabrication and assembly costs. 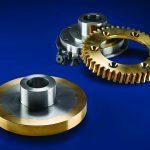 They also can take on the complex shapes needed in modern high efficiency gears, such as split path planetary drives, worm gears, and internal gears, at AGMA precision levels of Q6 to Q9. In addition to design flexibility, plastics are much less expensive than stamped or machined metal gears. Plastic gears are also relatively light in weight, resist many chemicals and can hold noise to a minimum. Their stiffness can be balanced to yield long gear life, yet allow teeth to absorb impact and deflect to compensate for inaccuracies and gear misalignment. 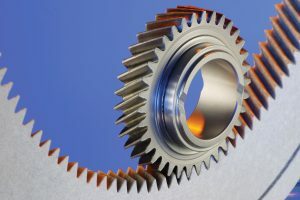 The inherent lubricity of many gear plastics allows them to be used where lubricants are unwelcome, such as in computer printers and toys. Designers may choose plastics for one benefit and find gains from many others. 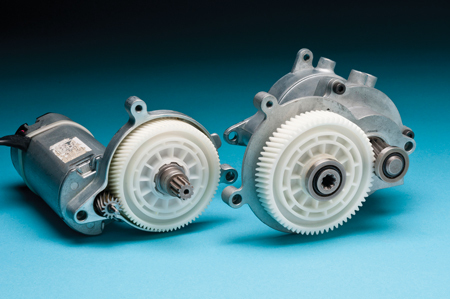 For instance, a manufacturer switched from a cast iron transmission to one using glass-reinforced Celcon® acetal copolymer to reduce noise in a five-gear, dual-drive washing machine transmission. 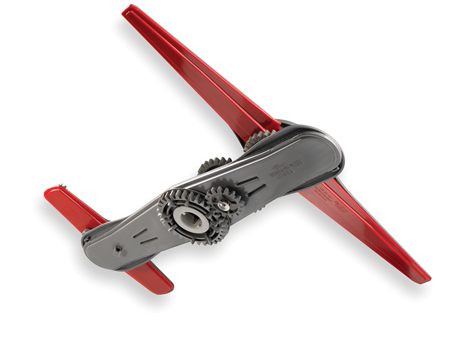 The design is a splitpower-path unit in which gear arrangement is symmetrical and balanced across the axis. 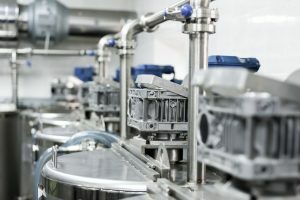 The resin and design also avoided the need for the counterweight typically found in other washing machine transmissions and eliminated the need for many secondary finishing operations. The new transmission had significantly fewer parts and was much lighter, making it easier to assemble the unit manually. 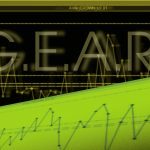 Plastic gear design is a dynamic field. It continues to take advantage of ongoing advances in engineering polymers, tooling, and molding methods. These advances allow designers to create efficient drives that meet the requirements of advanced mechanical and electromechanical elements in cars, appliances, industrial equipment, and much more.